Recently, Zoe wrote a post about the importance of refashioning and stashbusting, and I couldn’t agree more. If you haven’t already read it, I highly recommend it as a thought provoking and possibily confronting read. I have been thinking alot about this subject myself and it is a big reason why I started to sew again after many years, as there are so many items in my (and my mothers) wardrobe that are great fabric and quality but due to being too big, too small or a dated/ugly style are not worn. It just seems like such a waste. So recently I raided my mum’s wardrobe and my first refashion of bringing new life to an old moth eaten skirt is here. I am so thrilled with it, especially as when I wear it I love that I am wearing a piece of our family history. 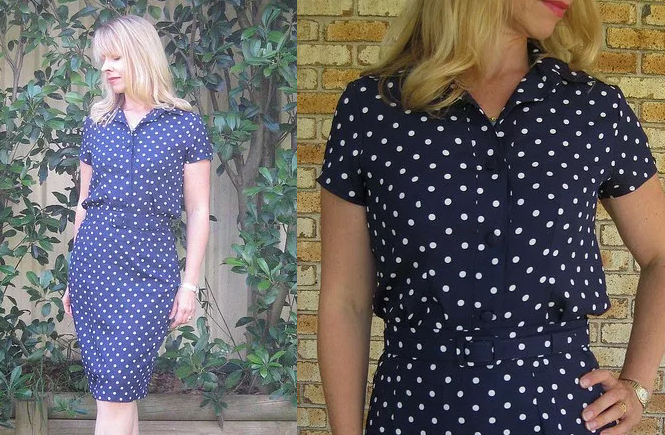 Enter this polka dot dress from the 1980s. 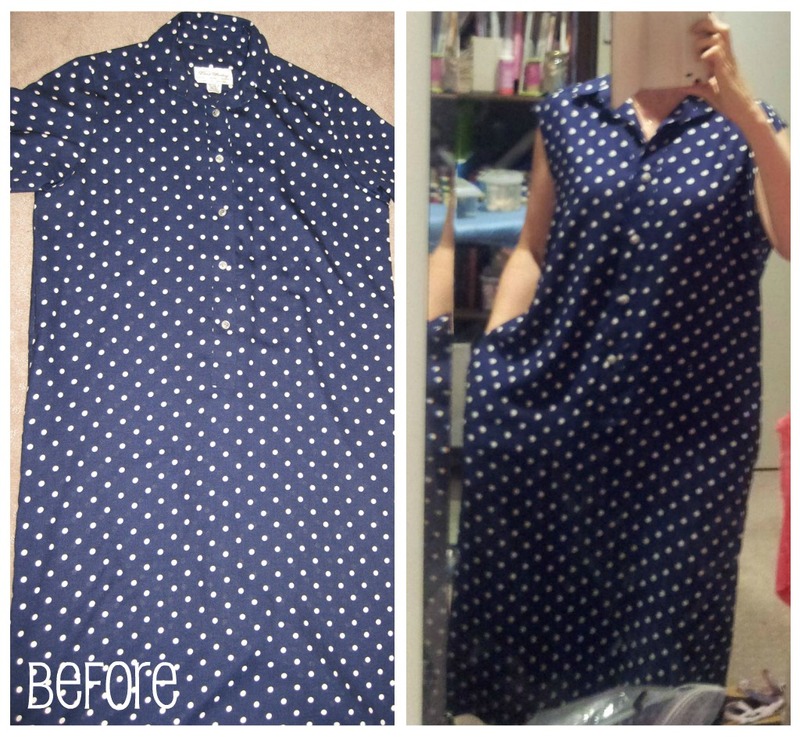 It was a size 16(AUS) and a shapeless shirtdress with footballers shoulders, complete with massive shoulder pads. Mmmm, nice. The photo is me wearing it is after I had taken off the shoulder pads and the massive sleeves. 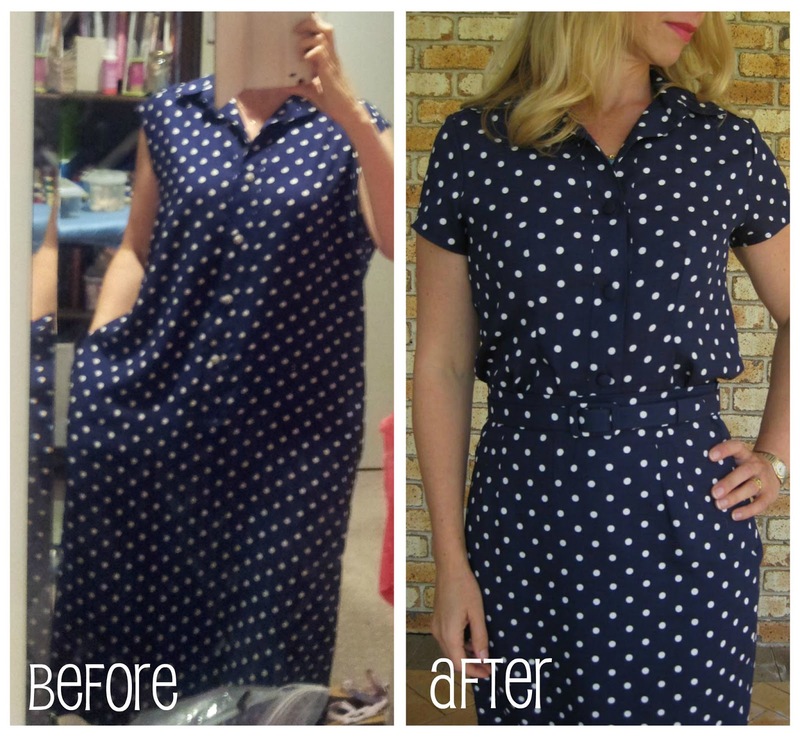 But I adore polka dots and navy so I knew I had to have a crack at turning this into something wearable. So with Mum’s blessing I took it and got work. I cut the dress in half and used Burdastyle Jenny to recut the skirt, leaving the centre back seam and vent untouched. Everything else is remade. I added a lapped side zipper and used the bottom part of the huge 1980’s sleeves for the waistband. I didn’t have enough fabric to overlap the waistband so I just added hooks and eyes. For the top I overlaid a bodice pattern that fitted well and recut the shoulders and armholes and sleeves, resewed the side seams and put in darts front and back to make it a bit less blousy and slightly more fitted. I removed the scary 1980’s buttons and replaced them with self covered buttons. You can just see in the bodice shot above the piecing I had to do in the underarm seams as the arm curve run out of fabric at the side seam (due to me cutting a smaller armhole into a much larger one) so I had to add in a triangle of fabric. I doubt anyone but me (and other seamstress) would notice though. The other thing is I had to patch a bit on the skirt as it was where the original button placket extended to. It looks a bit odd close up but from a distance is not visible as I matched the dot pattern as closely as I could. The only parts of the dress not redone was the centre back seam and vent on the skirt and the collar, yoke and button placket on the blouse. The fabric is just some kind of polyester but it pressed beautifully and was lovely to sew with, other than extreme fraying, which my serger promptly tamed. (Thank goodness for sergers/overlockers – this would have been a bit of a nightmare to sew without one due to the fraying). As this is now a skirt and a blouse I can also see myself wearing this as separates. I love the kelly green and navy combo and I am currently making a couple of things in kelly green which I think would look cute. I am also doing a refashion of an ivory blouse from Mum’s wardrobe as well, which I think will look good with the polka dot skirt. Thank you Mum for your lovely dress and once again, I love that I am wearing a piece with our family history.